Winco JC-4 Stainless Steel Hand Citrus Juicer, 5"
Get fresh and pure citrus juice with the Winco JC-4 Stainless Steel Hand Citrus Juicer, 5". Featuring solid stainless construction with an attractive mirror finish, these manual juicers are perfect for professional chefs and bartenders, or for anyone who appreciates freshly squeezed juice. 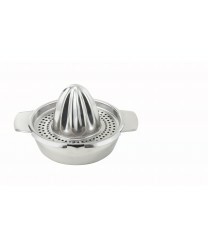 These hand juicers have a 5-inch diameter that easily accomodates oranges, lemons, limes and grapefruits.